During last few weeks I've been working really hard - that's why I constantly avoided posting any new info here - even although v4.3.5 was published. Another reason is my dissatisfaction in new DataObjects.Net v4.3.5 installer - I've been replacing it during may be each 3 days starting from the beginning of September, and there are still some things to improve there. I'm not happy just because of installer - the version of DO bundled there is definitely better then v4.3.1, i.e. if you use v4.3.1, it's strongly recommended to upgrade. New web projects can be hosted only by IIS 7 - not by ASP.NET Development Server. You must install additional components to even open such projects in VS2010/2008. You must be logged in as administrator to work with such projects. I'm curious, why Microsoft doesn't fix such issues ASAP? And finally, impersonation doesn't work in this mode. 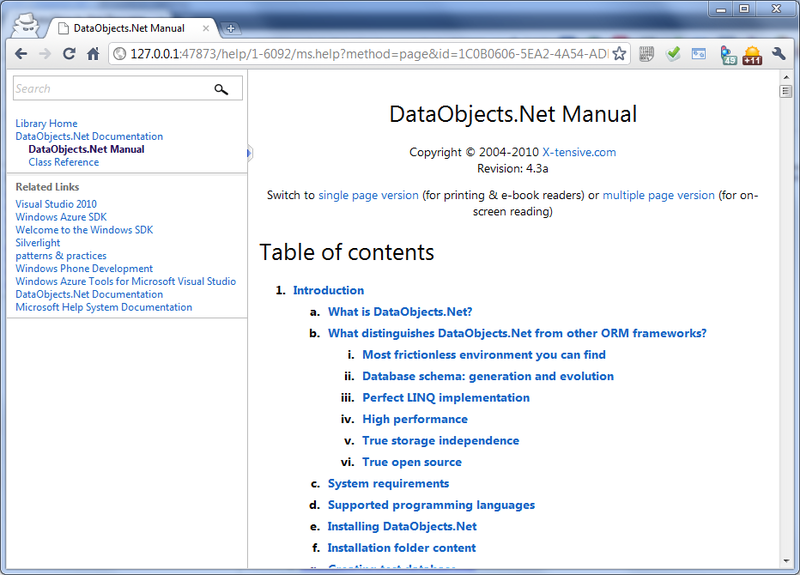 So you should enable ASP.NET 4.0 application pool identity to login to "DO40-Tests" database on SQL Server. And certainly, we'll work on manual - all new features (and some existing) must be described there. P.S. Today I'll publish one more post describing the improvements we've made in v4.3.5. 13.Sept ends and no new post about improvements within v4.3.5, can wait for it! True... The time is spent on one more update of v4.3.5 (build 6015). New installers will be uploaded in ~ 2 hours. 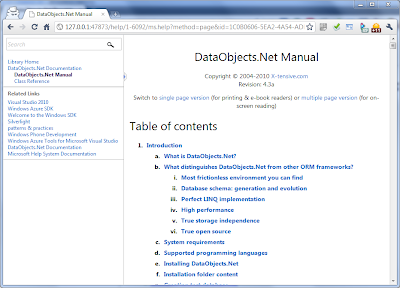 The most significant change is integration of DataObjects.Net Documentation into Visual Studio 2010 Documentation, and lots of fixes (about 150) in XML comments (class reference). Also, the new documentation is built byy the newest Sandcastle, so there are pretty important improvements. E.g. the lists of available extension methods look much better there.